Last Friday I wrote about having a Gin-Gin Mule at Morgan’s in La Quinta Resort. Actually, the first time I sampled this Audrey Saunders’ original was at the Tar Pit in Los Angeles. Saunders, aka the “Libation Goddess,” made a name for herself at Bemelman’s Bar at The Carlyle Hotel in New York before moving on to open her own place, the Pegu Club, five years ago. Her signature drink there, of course, was the Pegu Club Cocktail, a somewhat forgotten libation that was all the rage back when the British still had an empire and Myanmar (what a hideous name) was called Burma. Well, not for long it wasn’t. In 1942, the British abandoned Rangoon (now Yangon—another hideous name) as well as the Pegu Club in the face of the rapidly advancing Japanese infantry, and they seemed to have taken their cocktail with them. Until Saunders almost single-handedly revived it. While it’s not all that difficult to get a Pegu Club Cocktail in New York, it’s still rather rare elsewhere in the world. Which is why I was so thrilled to hear that Miss Saunders had partnered with Mark Peel at the Tar Pit in Los Angeles last December. Word was that she was going to go for “neo-tropical” and “old Hollywood swellegant” cocktails, which is exactly what she did. 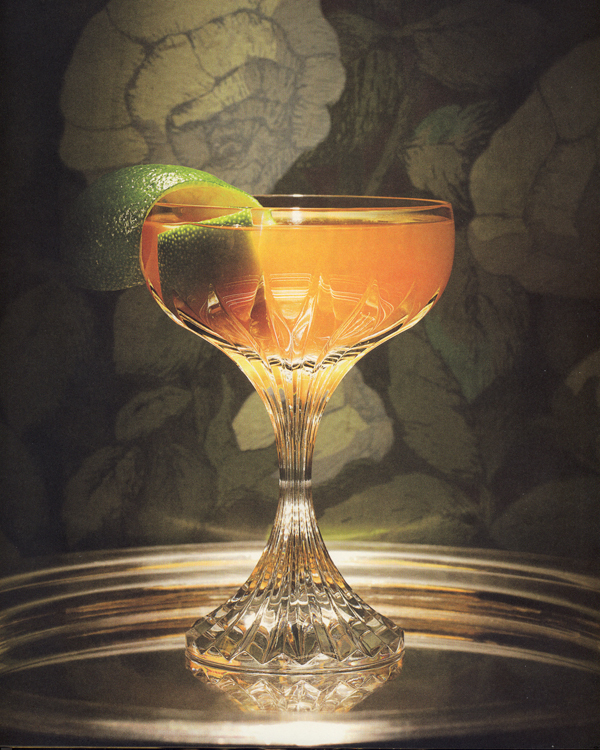 In addition to Saunders’ Gin-Gin Mule you could order a Jamaican Firefly (dark rum, housemade ginger beer—one of her signatures—fresh lime juice, and simple syrup) or a Fitty-Fitty (half gin, half French vermouth, with orange bitters—another Saunders signature ingredient). Alas, while the Gin-Gin Mule remains, Miss Saunders split with Peel and headed back to New York last month (just another reason to go to Morgan’s in the Desert at La Quinta). A couple of notes about the recipe: Saunders loves gin. She carries something like 26 different gins at her bar in New York (and keeps the vodka out of sight beneath the bar). So obviously she’s rather particular about which gin to use for any given cocktail. The traditional gin to use in a Pegu Club Cocktail is London Dry Gin. But I think Bombay Sapphire works just as well (and I like the idea of using a gin named Bombay in a cocktail invented in Burma; it all seems so tropical and cheerio). Secondly, you’ll notice the recipe calls for orange curaçao. You could use triple sec or Cointreau or something, but there’s a reason why she uses orange curaçao: for the coloring. It’s what gives the drink that lovely sunset glow. If you use triple sec you’ll get something that looks more like a margarita. Personally, I use a kumquat brandy that I make myself but you’ll have to come over to my house to try that (or make it yourself). They have a huge selection, including the ones you mention are hard to find. I love entertaining and serving drinks and have compiled quite a few cocktail recipes. I am excited to add this one to the collection… And of course, I will have to sample it first which is always the fun part. I think next time I am in NY I will have to visit the Pengu Club. It sounds fantastic. Thanks for sharing!!! 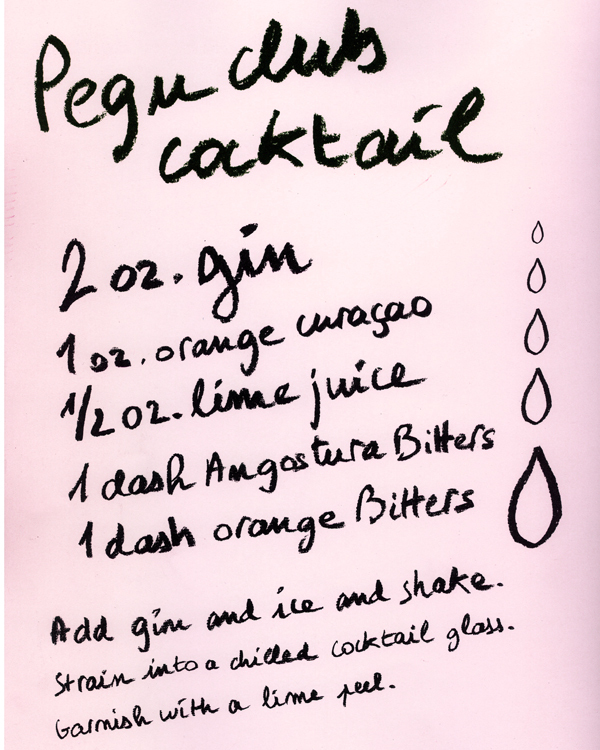 Thanks for the cocktail recipe, I am a big fan of making my own cocktails but after reading so much about the Pegu club i think next time i am in the USA i will have to make a vist. Its so nice to see places that have a nice cozy atmosphere. Can not wait to vist and see the bartenders work their magic. Do you mind if I quote a few of your posts as long as I provide credit and sources back to your site? My blog is in the exact same area of interest as yours and my visitors would definitely benefit from a lot of the information you provide here. Please let me know if this okay with you. Cheers!